Share the love this Valentine’s season by planning parties, fundraisers and more for your favorite groups. 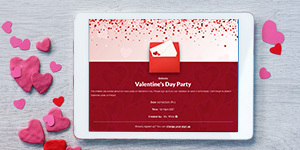 Whether you’re handing out heart-shaped messages or serving others, your events can benefit from these tips, ideas and creative sign up themes to streamline the planning process. Start with a simple structure when organizing a Valentine’s class party. Want to include activities, crafts, snacks? Why not all three? After you brainstorm options, you can build a sign up from your outline. When you create a class party sign up, include slots for volunteers, different types of food and craft supplies. That way all parents can contribute in a way that best suits them! Raising money for a cause or club? Use a sweet Valentine’s fundraiser idea, like a bake sale or date night raffle. Genius Tip: You can collect money directly on your sign up. Falling just a few days after Valentine’s Day, Random Acts of Kindness Day is a great opportunity to show love! Rally your group to spread kindness to friends, neighbors and even strangers with these 100 ideas. Little gestures can really add up. Whether it’s your children, significant other or friends, say “I love you” with these 100 ideas this Valentine’s Day. For a fun and low-key party with your neighbors or a couples’ group, consider watching a classic Valentine’s movie. A movie night is also great for a church youth group or middle school class, and it’s easy to create a chaperone and snack sign up. You’ve probably been to your share of Valentine’s Day parties, but have you ever celebrated Galentine’s Day? The February 13 tradition is a fun excuse to hang with your favorite women. Create an RSVP sign up and get ready to eat lots of chocolate and dance the night away. Your group members are lucky to have a genius organizer like you who thinks of others. Plus, they’ll really be giving you googly eyes when you grab a new multi-image Valentine’s design from our premium plan — offered now at our best price of the year!